Part of the Guru Guru hills where the Lamogi locals waged pitched battles against the colonialists. File photo. AMURU— Guru Guru hill in Lamogi sub-county in Amuru district has been named a tourist site. Guru Guru hill is a site where the Lamogi rebellion took place in 1911 when the British colonialists tried to impose their rule but were rejected by the Lamogi people under their famous cultural ruler Rwot Otto Yai. While opening the site on Sunday, December 3, Miss Tourism, Northern Uganda, Gloria Allele, said the Guru Guru site needs to be developed to promote local and international tourism because it has a lot of cultural uniqueness. She called upon the locals to embrace the development, adding that the site will help create employment opportunities for the locals. “Let us embrace the development because it is for all of us,” she said. Tonny Kilama, the director Hot spring tour and travel company in Amuru town, said the development is as a result of a joint partnership between Miss tourism northern region , Hot spring tour and travel and land owners. Gilbert Olanya, the area Member of Parliament for Kilak South in Amuru district, commended Allele and Kilama for the initiative, adding that he will endeavor to engage his fellow MPs to support the course. Olanya also called upon government to construct a monument in memory of the Lamogi people who fought against colonial rule. He added that the three great fighters buried in Lamogi; Rwot Otto Yai, Elimo and Anyayo should have their graveyard refurbished and opened for tourists so that they can learn the 20th century history. Kenneri Lakane, 80, son of Anyayo, who was the personal bodyguard of Rwot Otto Yai during the rebellion, said the development will help expose the rich culture of Lamogi people. He, however, noted that a clear agenda on profit sharing should be well stipulated to motivate people to add land for development. MP Gilbert Olanya lays foundation brick at Guru Guru Hill as Tourism queen Allele looks on. Photo by David Okema. 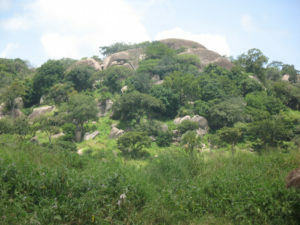 Among the fascinating things about Guru Guru hill is the blood stain of Lamogi people killed by Catholic missionaries that still exist on the rocks, the water well oozing from the rock which was the only water point that the Lamogi would access as they hid in their caves and would sneak out occasionally to draw water using their calabashes. Other attractions include the curved holes for playing games like ‘mwezo’ (tuku coro in Acholi language), several caves that served as hiding grounds and the delicacy food bats that the people still eat. The major cause of the 1911 Lamogi rebellion was the demand by British colonialists to have guns owned by Acholi people registered so that unwanted use of guns is prevented, a factor which didn’t go well with the populace hence sparking off the fight. The Lamogi then decided to hide in caves with their guns, bow and arrows but the colonialists were determined to get them even from the caves. A missionary soldier soon shot dead a senior body guard of Rwot Otto Yai named Abere, prompting the Lamogi people to retaliate. The Lamogi fighters in revenge killed a white missionary named Captian Tana when he tried to follow people in the caves. He was shot with an acidic arrow and later died due to rotting of the wound. Catholic missionaries reacted furiously by bombing the rocks, killing many locals in the process and thereby forcing Rwot Otto Yai to surrender.